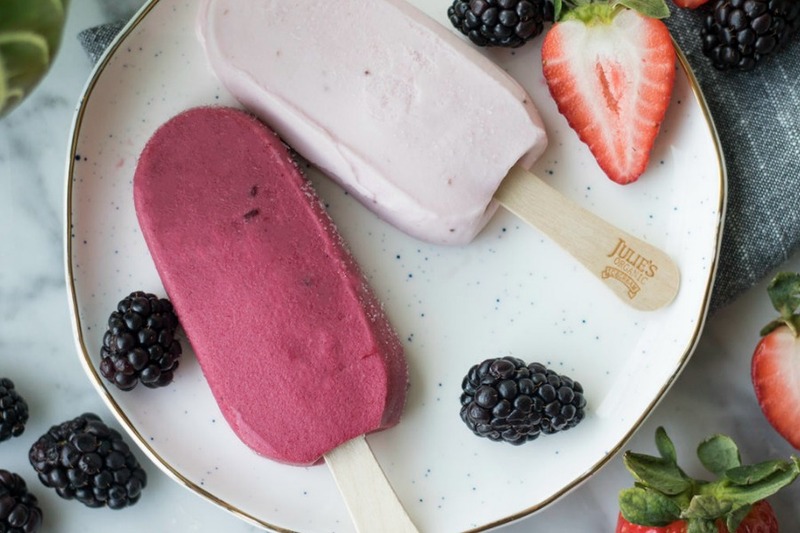 We found the best low-sugar popsicle brands, and it wasn't easy! Are there any popsicle brands with low sugar? Surely we’re not the only ones asking the question, now that it’s officially (according to our kids) popsicle season. In an ideal world, I’d make homemade popsicles with fresh fruit and water every time, but there’s something lovely about the spontaneity of popping (ha, couldn’t resist) into a corner deli or supermarket, or a visit to an ice cream truck when the heat of summer gets to us. With that said, I did some exploring and came up with the best low-sugar popsicle brands to keep your eyes out for. It’s not that easy; the FDA doesn’t have a definition for low-sugar, which is why you won’t see the “low-sugar” claim on packages the way you do for low-fat or low-sodium. Just keep in mind that “low sugar” is totally relative when it comes to popsicles, and we are talking about fruit, after all. What are the best low-sugar popsicle brands in the supermarket? Let’s start with the popsicle brands you may be used to seeing in your supermarket aisles. When you’re looking for popsicles made with actual fruit, Whole Fruit is a popsicle brand that’s widely available, with the flavors between 50 and 140 calories (for coconut). 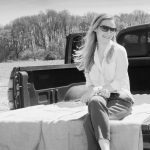 The Whole Fruit Strawberry Fruit Bars are the lowest-sugar option, with strawberries listed as the first ingredient and 12 total grams of organic sugar and corn syrup solids combined. 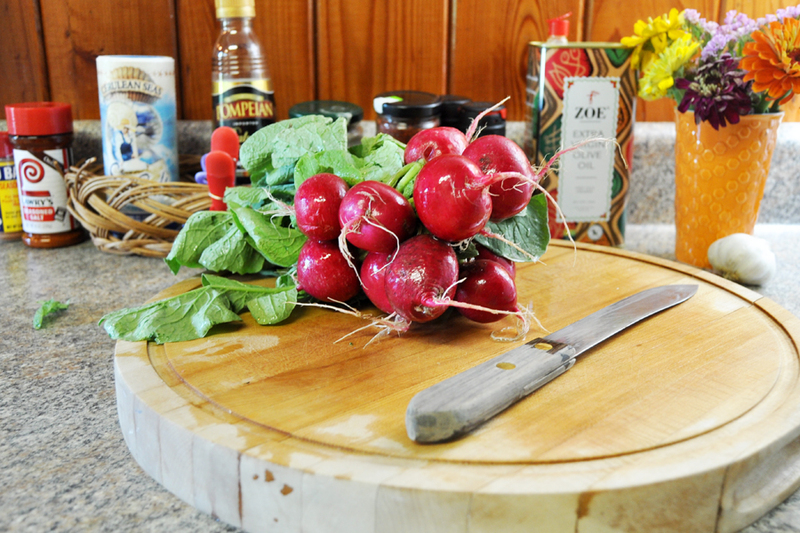 Bonus: the coloring comes from beets, not chemicals. Whole Fruit does make strawberry and lime sugar-free popsicle that has 50 calories, but they’re sweetened with Splenda. Good to know if you’re buying for kids and avoid artificial sweeteners. 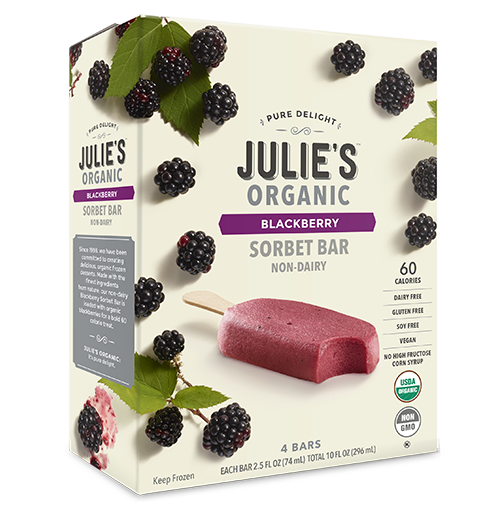 Julie’s Organic Sorbet Bars (also at very top) are a similar option with 12 grams of sugar; 1 gram from the blackberries in their blackberry non-dairy sorbet bars, 11 grams of added sugar from cane sugar, tapioca syrup, and beet juice concentrate. They also offer a Mango Passion flavor with 13g sugar. 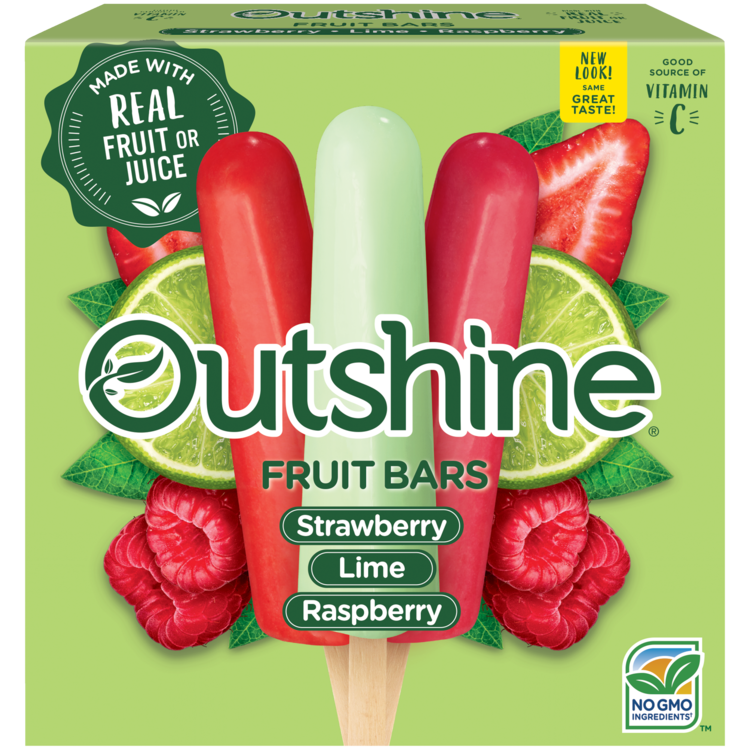 Outshine Bars have 10 grams of sugar in their strawberry, cherry, grape, tangerine and raspberry popsicles (they come in packs of three flavor combos each), and also list fruit before cane sugar in the ingredients. Good news for lime lovers: The lime flavor has just 8 grams of sugar. I also learned something new today: Popsicle is a brand name! And the red, white, and blue ones that look like rockets are actually called Firecrackers. (You may think of them as Bomb Pops but that’s actually its own brand.) While they only have 6 grams of sugar, it’s all from corn syrup, high fructose corn syrup, and refined sugar. Good reminder that low-sugar isn’t the only thing to look for on a label. Popsicle does offer another product line called Simply Popsicle, with sugar only from cane sugar and beets, and the benefit of no artificial colors. All the flavors, which range from classics like grape and cherry to pineapple and strawberry-banana, each have 9 grams of sugar. Those Fla-Vor-Ice tubes are a summertime treat for so many families, and I have lots of my own memories of them! 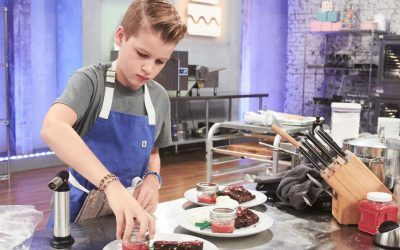 They have just 5 grams of sugar each, but the downside? 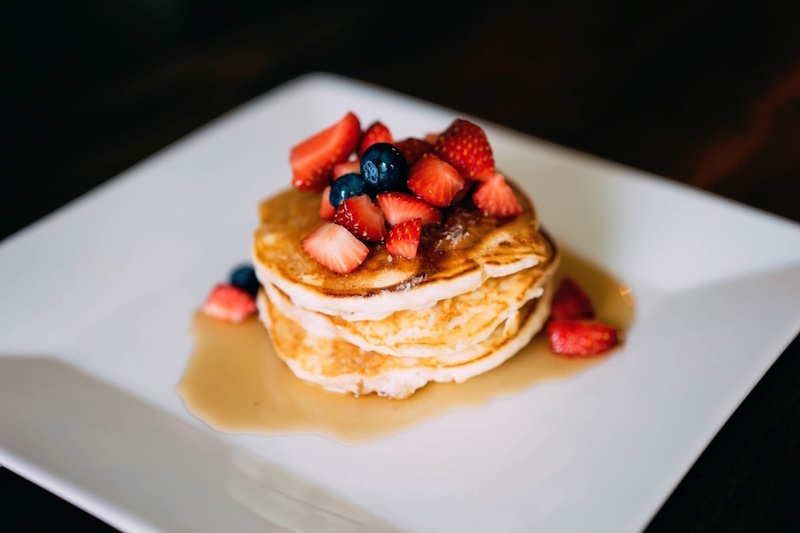 The first ingredient after water is high fructose corn syrup, and they also have artificial coloring and flavors. Essentially, they offer nothing nutritional whatsoever. In other words, perfect for when your kids want something cold and you’re at the beach with Grandma, 100 miles from a Whole Foods. Full disclosure: My children have consumed more of these than I can count, along with plenty of healthy stuff. They’re growing normally and seem to be pretty decent people so far. I’m all about moderation. Just now that low-sugar popsicles doesn’t always mean healthy popsicles. Are there any popsicles with no added sugar? Paleo Passion makes frozen popsicle style bars with no added, refined, or processed sugar. 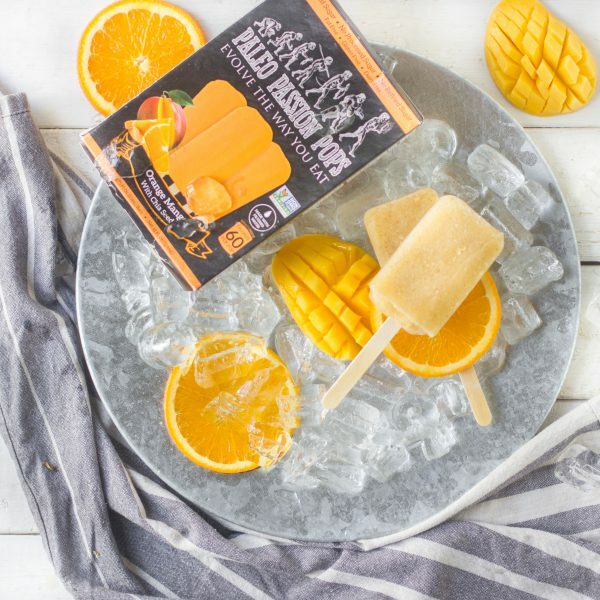 The Paleo Passion Orange Mango Pop has 10 grams of sugar and contains water, mango juice, pear and orange juice concentrate, ginger juice, chia seeds, and guar gum. The six other Paleo Passion flavors include strawberry, coconut (“Kokonut”), plus more sophisticated flavor combos like pineapple-ginger and blueberry-pomegranate. Ruby Rockets may be the healthiest low-sugar popsicle brand out there, since they’re all made from whole foods with no added sugar. The Rock-It Red frozen pop has just 4 grams of sugar, thanks to strawberries, lemons, carrots, sweet potatoes, and beets. That’s practically a meal for some kids! The Gravity Grape frozen pop has 6g sugar, thanks to grape juice concentrates, sweet potato and blueberry puree, purple sweet potato juice concentrate, dried acai, and monk fruit extract. Just don’t tell the kids. 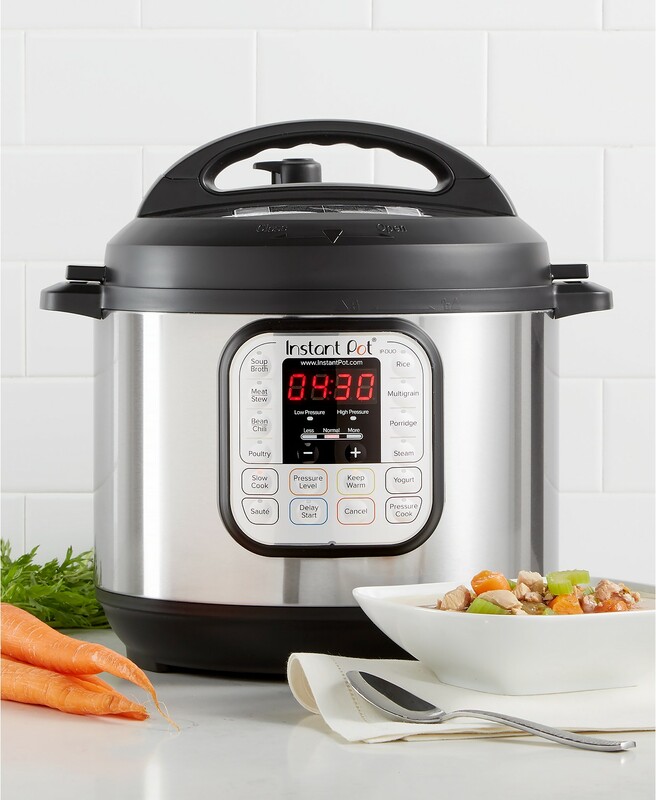 This is a brand that comes highly recommended to me — but they may be hard to find. The location closest to me is 162 miles away, which kind of kills the spontaneity. They deliver and shipping is free! You’ll have to order a minimum of six boxes, but if you go through popsicles like we do over the summer, why not. You’ll have an awesome low-sugar popsicle brand to get the kids straight through August. Or, at least July. NB: Just keep in mind the lower sugar in these pops is in part due to the smaller size. 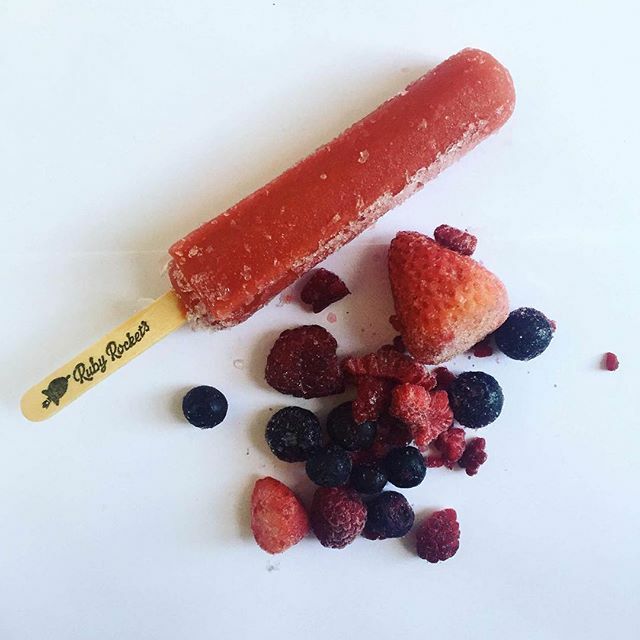 One Ruby Rocket frozen pop is just 52 grams total, compared with about an 81-gram Whole Fruit bar, or a 74-gram popsicle from Julie’s organic. Is sugar your only concern when it comes to frozen treats? How about a little protein? When I was pregnant with my third child, in the middle of a hot South Carolina summer, I craved really cold sweets. 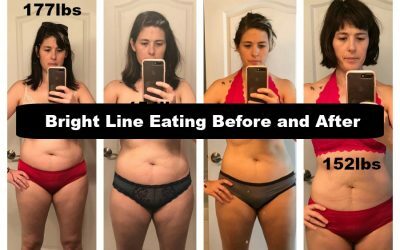 As a mom who had experienced HELLP syndrome and pre-eclampsia in my first two pregnancies, I knew I needed protein and that I should lay off the sugar, but I only wanted popsicles. 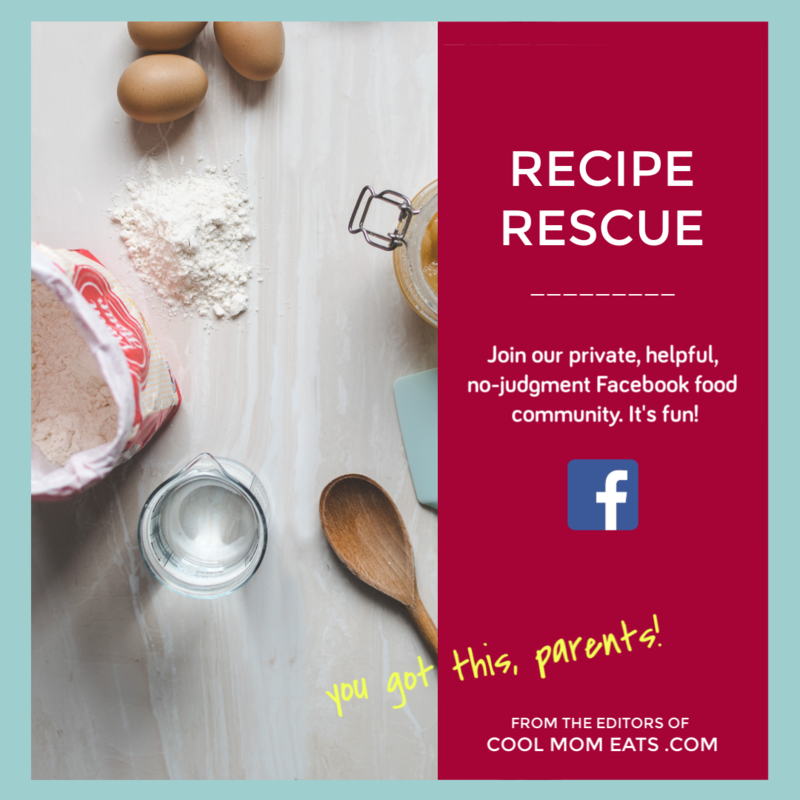 Frozen tubes of yogurt satisfied my cravings and provided a little bit of protein with minimal sugar so I wanted to include them here as an alternative to low-sugar popsicles for you and your family. 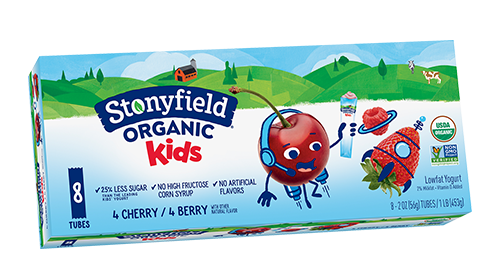 Stonyfield Kids’ Organic Cherry Tubes were my jam (no pun intended), and with 6 grams of sugar and 2 grams of protein, they were an alright option for me. I felt okay giving them to my older kids, too. They have about the same amount of sugar as some popsicles — which is a lot less than many — and a hint of protein (2g) which is a nice benefit. 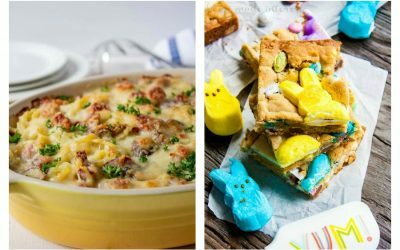 Other brands that offer similar include Organic Valley’s Grassmilk Kids Yogurt Tubes (6g sugar in one 2oz tube), and Annie’s Organic Whole Milk Yogurt Tubes (also 6g of sugar in a 2oz tube). Hey, when it’s hot out and you want to be at least a little healthy with your treats, it’s great to have option. Do you have an opinion on which of these brands would taste best to kids who eat a lot of real fruits, but also a fair amount of traditional popsicles? 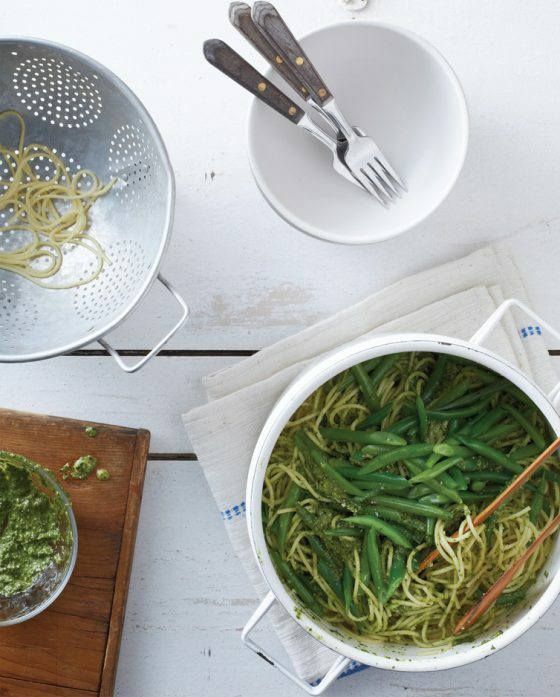 They never like the healthy ones I buy – I need to slowly move them to the healthier side! Thank you! That’s a great question! I’m no expert, but I think sometimes kids just need time to get used to a new thing? I would maybe start with Outshine or Simply Popsicle (the no refined sugar version from Popsicle) because they seem the most like regular popsicles. Do your kids enjoy frozen grapes or banana slices? Mine all enjoy those, though the grapes could be dangerous for younger kids. I am so intrigued by Ruby Rockets and I’m thinking I’ll go ahead and order them and the adults will eat them if the kids won’t! 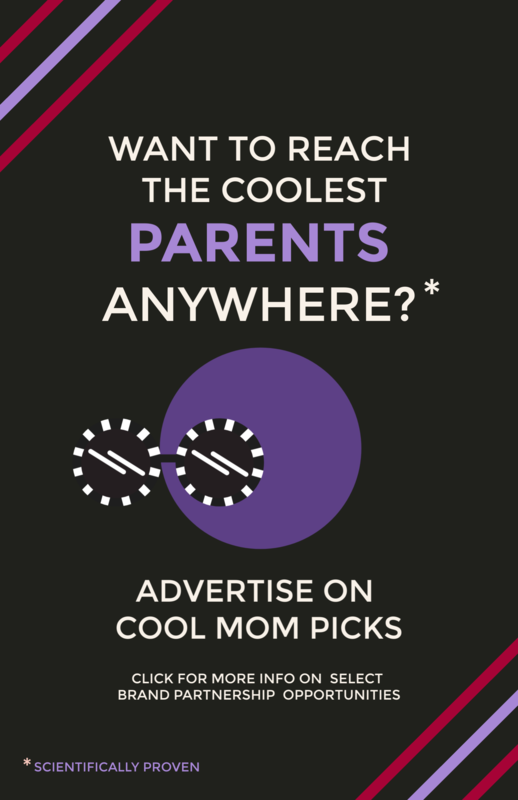 wow….kids will definitely love this and for parents this is good news,you can indulge your kids without worrying. We hope it helps. 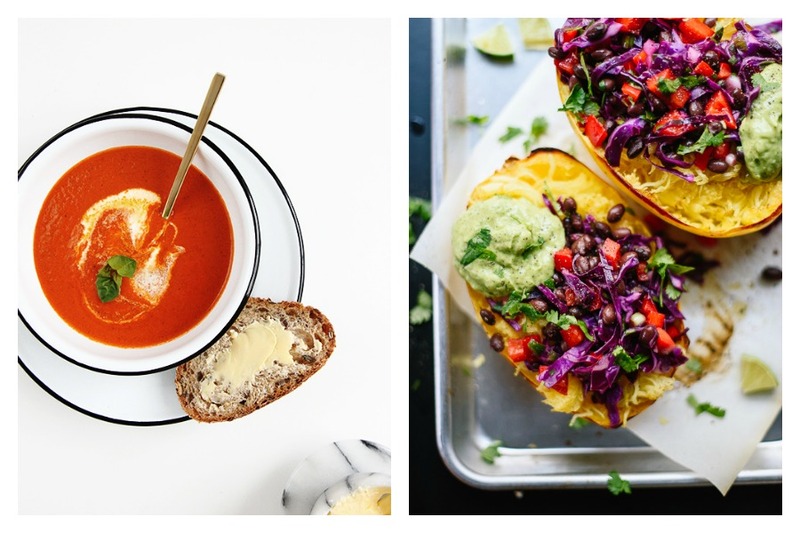 Summer can be such a sugar onslaught! !